InVogueJewelry: What is "Scorolite Opal"? Is It Quartz? Is It Scapolite? What is "Scorolite Opal"? Is It Quartz? Is It Scapolite? "Scorolite Opal" - Or Quartz? Someone asked the question "What is Scorolite Opal?" today on Etsy's forums. And there were many responses from some of the fabulous and informed Etsy jewelry sellers. So what is it? The bottom line is: there is no such gemstone as "Scorolite Opal". It is possibly glass, or coated quartz, or light-colored (and poor quality) Amethyst, which is purple quartz, or some other quartz such as "Lavender Moon Quartz". There is no mention of this stone anywhere---not on mindat.org (except for a discussion regarding "fakes, frauds and marketing ploys"), not on the GIA's website, nowhere outside of Etsy. Not even on Ebay!! If you google "Scorolite Opal", the search results are all for shops on Etsy, or for sellers who have websites but also shops on Etsy. Once again, it's a "stone" that is marketed primarily TO Etsy sellers from gem wholesalers, some located in the US and some in India. When I searched on Etsy for strands of this stone sold by suppliers, at least one result was simply Opalite being sold as "Scorolite Opal". Opalite is glass, not any sort of a gemstone, totally man-made. There were 8 results total. Some of these stones are more clear and glowing, some are nearly opaque, some seem to have a moonstone-like "adularescence" within the stone, some are more blue...they are all different. “relatively new gemstone”. There it is described as “purple/greyish”, and sometimes even “colour change” or “tenebrescent”. Now , genuine scorodite is occasionally faceted as a gemstone, but very rarely since it is too soft for anything but collectors of rare gemstones, and very few facetable crystals exist. Those that do are prized by collectors because of their beautiful green-blue colour. Curious about what exactly this material was, your editor purchased some “scorolite” beads (actually advertised as “scorodite”) on ebay.The specific gravity of the material was much too light for scorodite. I then sent it to KerryDay of KGD Minerals in Ottawa, who performed EDS on a sample. Conclusion: the "scorolite/scorodite” was actually just quartz,var. amethyst — and not particularly nice amethyst at that." This article (above) refers to Scorodite. This is from 2009---six years ago! There is a gem called "Scorodite" which is a natural mineral. Scorodite is an incredibly beautiful mineral found in ranges of intense blues, and is nothing like this Scorolite stone. When I first read about this "Scorolite Opal" and looked at pictures of it, my first thought was that it was maybe purple Scapolite. Maybe a typo somewhere along the way led from Scapolite to Scorolite...? 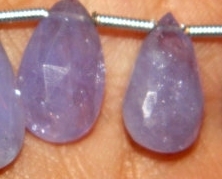 However, Scapolite is a genuine gemstone (purple, similar looking to amethyst), and is NOT any sort of Opal. Some of these "Scorolite" stones look quite pretty. Some look a LOT like purple Scapolite, or like pale Amethyst, or even translucent chalcedony quartz. They would probably be a nice, fun addition to a jewelry collection. But it's NOT any sort of Opal gemstone, it's not a "new, rare" gemstone, and is most likely quartz, whether natural or coated, or perhaps man-made. 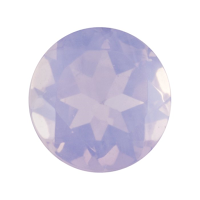 There is a gemstone, a variety of quartz, called "Lavender Moon Quartz". It is just beautiful, and has a translucent soft lavender glow. It looks a little like moonstone, it has an opalescent glow, and a little like translucent chalcedony. But it's none of those---it's a variety of quartz all its own. I noticed some of this so-called Scorolite Opal jewelry on Etsy that has more of this lavender "glow". I am guessing that some of this "Scorolite" is actually the beautiful Lavender Moon Quartz. Some other "Scorolite" appears to be amethyst (it doesn't possess this glow) or some other type of quartz, some maybe scapolite, and some are obviously Opalite. That picture doesn't really capture the beauty and luminous glow of this stone. I googled images of Lavender Moon Quartz and I see that some very high-end designers (Yurman, for example) have used Lavender Moon Quartz in their jewelry. It's SO beautiful, and it's a natural gemstone! Thanks for your comment! This post is a couple of years old, but still holds true. Hello, I have been researching this stone and came across something Interesting . It is said that Scorolite is from the heating process of middle part of Amethyst. I'm assuming like Chevron Amethyst. Just another perspective. Hi! Thanks for your comment! The term "scorolite" has been around since at least 2009. It was a name given to different materials---whether glass or a synthetic quartz or some type of milky quartz---and nothing has changed since. 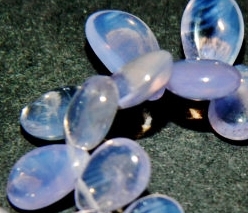 There are still strands of "scorolite" beads sold, and there still is no such mineral as scorolite. The "scorolite" beads being sold could be some kind of amethyst, or other type of quartz, whether man-made or natural, or synthetic or man-made beads. Sellers use these types of "trade names" (which are just made-up names) to generate interest in selling their items. I call it "creative marketing." 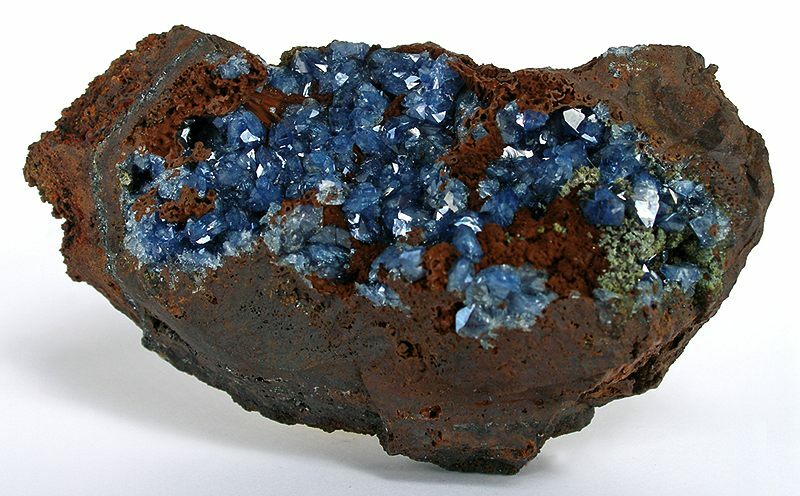 So there is no actual mineral called scorolite, and who knows what is actually being sold? If I had genuine amethyst beads, I'd sell them as amethyst or lavender quartz. Although "strawberry quartz" can be a real gem (quartz with iron oxide inclusions), there is no such gem as "green strawberry quartz"---lepidocrocite (iron oxide) is red to brownish red, not green. So this name is just...stupid. The picture on ebay could be plastic, or glass, or dyed quartz, so it's hard to say what that is. There are quartz stones with green "mossy" minerals inside, but they're not a bright kelly green like that stone. So I'm not at all sure what that is...but it's for sure not "green strawberry quartz" which is a really silly name. Looking at google images of "green strawberry quartz" I can see either glass beads or probably aventurine, and a couple of crystals with some sort of mossy minerals inside. Thanks for asking about that stone! I have no idea what that is, but my guess is, glass or something dyed.